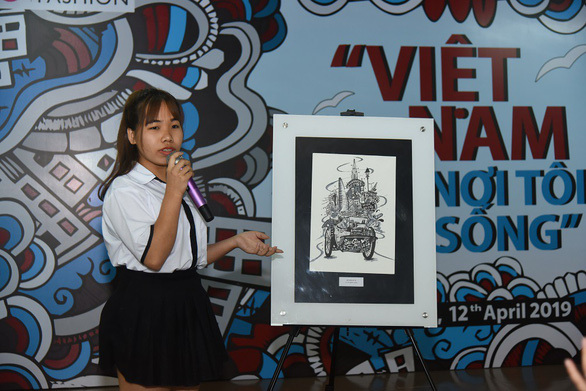 A teenage girl from the Mekong Delta province of Tra Vinh who has been living in Ho Chi Minh City for less than one year has won a design contest with a drawing that crams most of the southern metropolis’ typical landmarks and uniqueness into one place. 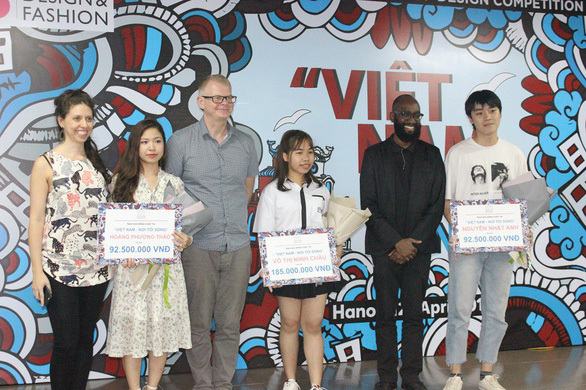 Vo Thi Minh Chau, who grew up with the absence of her father, was on Friday announced winner of the top prize worth VND190 million (US$8,170) of the “Vietnam - Where I live” competition, which is organized by the Hanoi-based London College for Design and Fashion (LCDF). Having moved from a countryside region to Ho Chi Minh City for a mere nine months, Chau put all her sentimental observation and feelings about the modern and vibrant hub into her award-winning painting, entitled “Sai Gon le la” (Wandering in Saigon), affectionately using the former name of the city. 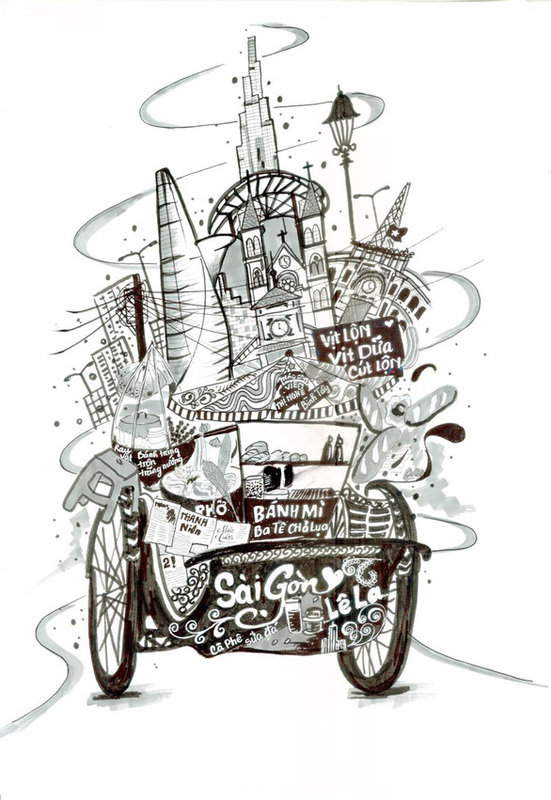 In “Sai Gon le la,” the teenage girl tried to put as many possible things that make Saigon Saigon onto a cyclo, a three-wheel bicycle taxi that was popular on the city’s streets in the good old days. Those ‘most Saigon things’ include not only such architecture landmarks as the Notre-Dame Cathedral, Ben Thanh Market, the municipal Post Office, Bitexco Tower, and Landmark 81 skyscraper, but also the city’s tangled “spiderweb” of electrical wires, and its sidewalk stalls selling famous street foods including banh mi, iced milky coffee, and fetal duck eggs. Chau had almost missed the competition as she only got to know about it two days before entry submission was closed. But Chau’s drawing turned out to be an interestingly attractive submission to the competition judges, according to British design expert Mark Bellingham. Among the top five finalists of the contest, only Chau’s work was painted in black and white, which not only secures the lavish splendor of the dynamic, modern city but also helps increase mystery to its appearance, the judging panel remarked. The judges see the work as an appealing invitation that people should come to Saigon to wander on its many streets and explore them. Speaking to Tuoi Tre (Youth) newspaper after the awards ceremony, Chau said she lost her father since she was little, and did not grow up with her mother either, spending her childhood living with her uncle and his wife. As the uncle’s family was also hit by poverty, Chau would always try to win scholarships to cover her tuition fees throughout 12 years of schooling. Last year Chau passed the entrance exam to the fashion design department of the Ho Chi Minh City University of Technology but had to give up on her academic dreams to find a job to make ends meet. 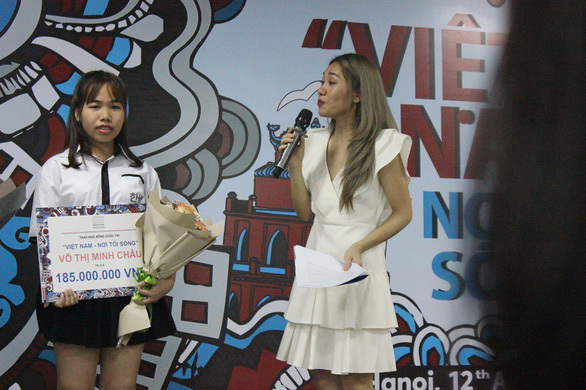 The VND190 million prize of the competition consists of VND5 million in cash and a VND185 million scholarship for a freshman year at LCDF, which allows Chau to resume her passion of fashion design. Friday’s awards ceremony also honored Hoang Phuong Thao as first runner-up, and Nguyen Nhat Anh as second runner-up, while granted the Idea prize to Nguyen Ngoc Tram Anh, and the Promising young designer award to Truong Tuong Vi.